← Reiss SS14. Blue: The Trend. Dressing for the British summer is notoriously difficult. Now that the mercury has well and truly risen, it is time for every self discerning sartorial dresser to ensure that their summer wardrobes will keep them looking stylish in the heat. We all know how unpredictable the British weather can be, so here’s how to prepare for the summer and make sure that your wardrobe will be able to cope. Firstly, we need to start with the basics. Get out your summer wear, and check to see what condition it’s in. Are a few items looking rugged and in need of replacement? If so, start with these. If you make sure that your wardrobe is full of basics, everything should go together easily to form an outfit. Think neutral colours such as grey, white and navy. Offshoots of these include brown, khaki and other shades of blue. You’ll need tee shirts, polos, oxford button down shirts, chinos, jeans and shorts. One or two of each will have you prepared for all manner of different outfit choices. To keep the chill off, lightweight jumpers and outerwear will see you through the night. Don’t forget a well-cut blazer and a good waterproof mac or harrington will protect you from those British showers. With a note on basics, make sure that they fit you perfectly and that you’re confident with how you look in them. Many men favour brand loyalty over fit, yet if you’re favourite brand’s tee shirts aren’t the right cut for you, it’s time to shop elsewhere. By making sure that you have a staple collection of well-fitting clothes that can be worn together in all manner of outfits, you’ll find that dressing is a hundred times easier in the morning. Now that we’ve covered the basics, you’ll also need to think about fabrics. 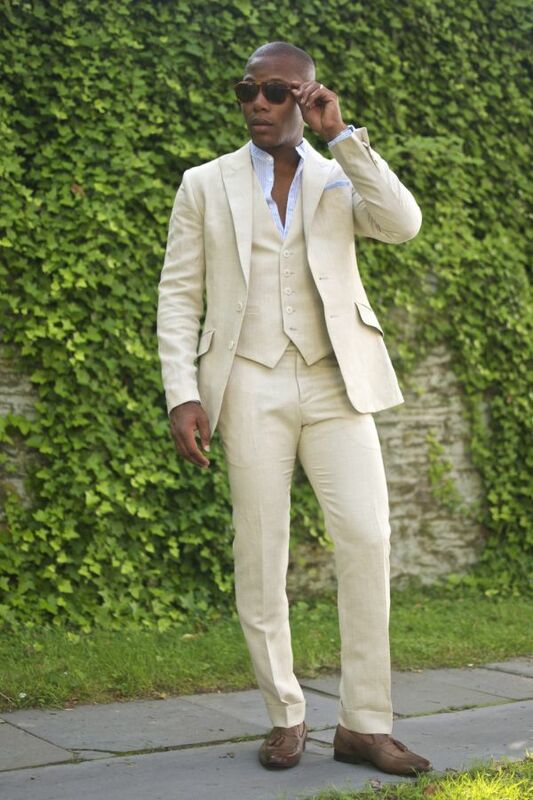 Make sure that you opt for breathable materials such as cotton, linen, silk and seersucker. These are known for their lightweight and airy qualities, and are perfect for the British summer as they can easily be layered on top of each other to keep you warm. Don’t worry though, if a pure silk jumper is out of your price range, a cotton and silk blend will do the trick for a fraction of the price. A tip to remember, always buy the best quality that you can afford, That way your clothing should last as long as possible without having to replace items every year. Make sure you shop around, and you’ll be sure to find what you need. Look for lightweight blazers in the above fabrics, a cotton and linen blend will be perfect for a summer jacket. Navy is timeless, but don’t be afraid to go for lighter shades of blue or cream, and if you wish for something different, why not opt for a pastel shade or brighter statement colour to go with your neutral basics? The key to dressing in our climate is to master the art of layering lightweight fabrics. This is where those neutral colours come in handy. Once successful, you’ll be able to add and remove layers when the weather takes a turn for the worse, or the better, all with the greatest of ease. So layer that silk v-neck jumper between your oxford button down and blazer when the temperature drops, but go for a tee shirt and linen blazer when the sun’s at its hottest. Once you have a staple wardrobe in place, you can then start introducing colour and print. How about bright polo shirts with neutral shorts or chinos, or a printed shirt under your blazer or jumper? Make sure you only have one bright garment in your outfit, and anchor the rest of it with basic colours. When you’re shopping and see something bright and colourful, make sure you can justify splashing out rather than putting the money towards repairing or upgrading a staple item that’s seen its best. It’s also a good idea to think carefully about what you’d wear an item with before you buy it to ensure that it won’t be neglected. There’s nothing worse than coming home from a shopping spree and finding that none of your outfits go together. Summer sees a host of unusual colours and prints, so make sure you don’t go overboard, and purchase wisely. By ensuring that your wardrobe basics are up to scratch, you shouldn’t have this problem. Footwear is always a tricky one in Britain when you’re not sure what the weather will do next. Going sockless is an easy way to embrace the summer, but make sure you buy sock liners to stop your feet overheating. They’ll help to prolong the life of your shoes, prevent odours, and nobody will even know you’re wearing them. Also, make sure that you have your basics covered, a good pair of brogues, loafers and boots will work in most occasions. A dark-medium brown will bear you in good stead, although tan works nicely too. Once you’ve got the basics, it’s time to release your inner shoe penchant. Suede can be worn only if you’re sure that it won’t rain. Available in a variety of colours, bright and neutral, you can easily add a touch of personality to your outfit. They are also lightweight and breathable. 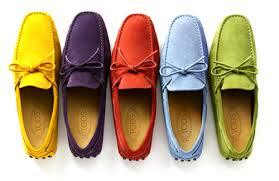 Look for suede loafers, brogues or driving shoes, and play with colour to make a statement. If you’re not brave enough for suede, then opt for a good pair of leather shoes. On the smart side, think tan brogues or loafers, and if you wish to err on the side of casual; driving shoes, trainers, boat shoes or luxe espadrilles will be great options. Even though they’ll hold up in wet weather, make sure you spray them with a water protector just in case. Although tan is most versatile, the summer pays tribute to brighter hues from catwalk to high street, so look for something unique to make you stand out from the crowd. Now for the finishing touch, accessories can make or break an outfit. The key to being in control is to abide by the rule of three. Any more than this, and you’ll overcomplicate your outfit. With accessories it’s important to establish what kind of dresser you are. If your wardrobe is full of basic colours that go together, then you can experiment with prints and bright colours when it comes to accessories. An easy trick is to wear bright socks with an outfit and roll your hems. Or why not try a colourful pocket square in your navy blazer for a bit of fun? An interesting belt is also an easy way to add character to your ensemble without having to try too hard. If your wardrobe is colourful and trend led, then plain conservative colours will work better. Think about different textures and fabrics instead for your points of interest. A knitted navy tie will always have a place, as well as plaited leather belt in a conservative colour. You could go for timeless items such as a watch or sunglasses, or for the adventurous, try a summer scarf or a trilby or panama hat to give your outfit a touch of flair. So there you have it. 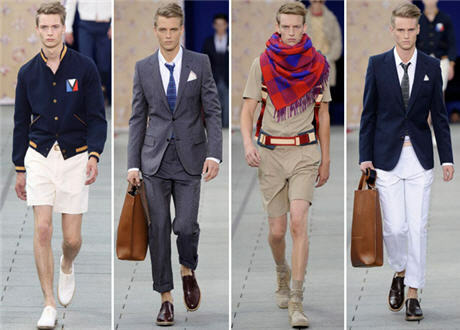 How to approach dressing this, and every summer in the British climate. Stock up on the basics, then feel free to explore colour and print, and let your imagine run wild.